Restore your smile with our tailored restorative dental treatments. Have you suffered from single, multiple or even total tooth loss? With the help of dental implants you can reclaim your smile and your dignity. As one of the most significant advancements in dental technology to date, dental implants have elevated the results restorative dentists can achieve dramatically. Mimicking the performance of a patient’s missing tooth root, dental implants are surgically placed into the site of tooth loss to form a solid foundation for prosthetic tooth replacements such as crowns and bridges. Mimic the feel, form and function of your missing tooth better than any other restorative treatment to date. Tooth loss can have a dramatic impact on the health and appearance of your smile, and as such it is important to seek appropriate restorative treatment as soon as possible. At your initial consultation Dr. Rogers will assess the condition of your gums, any remaining teeth and the amount of underlying jawbone to determine whether we can continue to the next stage of treatment. If any gum disease or tooth decay is present, these will first need to be eliminated before surgery can commence. Dr. Rogers uses a team approach involving local dental Oral Surgeons to provide the highest success of your implant placement. If your mouth is free of dental disease and you have been found a suitable candidate, we can move on to creating your treatment plan. This will outline the treatment in more detail so you can understand what to expect. Placing the dental implant requires dental surgery, and as with any other surgical procedure it involves risks and possible complications. These will be discussed with you in depth before your surgery. If you are fully informed and choose to continue, we will set up a surgical appointment with the oral surgeons so you can undergo implant surgery. Once your surgery is complete, the implant needs to be left to heal with the surrounding jawbone. This can take anywhere from 3-6 months and varies from case to case. 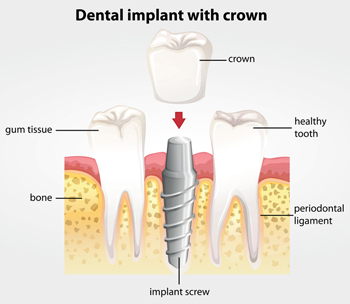 Once your implant has healed completely we will then bring you in for a short appointment to assess the implant, take impressions of the implant and have a custom crown, bridge or denture made at our local lab. Once the lab has completed the work we will place the crown, bridge, or denture over the implants to complete the process.